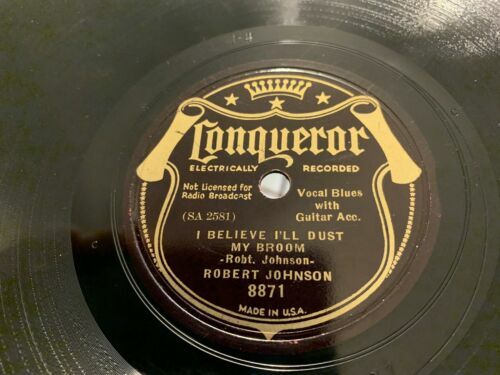 Pre-war delta Blues 78 RPM by Robert Johnson On Conqueror records #8871 “Dust My Broom”/“dead shrimp blues” pressed with the original Vocalion Pressing Masters. Grades V to V plus, clean labels lite scuffs and couple of scratches with some surprisingly glossy grooves. plays to grade or a little better. Not perfect but a nice lightly use copy of this very rare and desirable record. Shipped priority mail insured. international shipping registered or priority international mail.